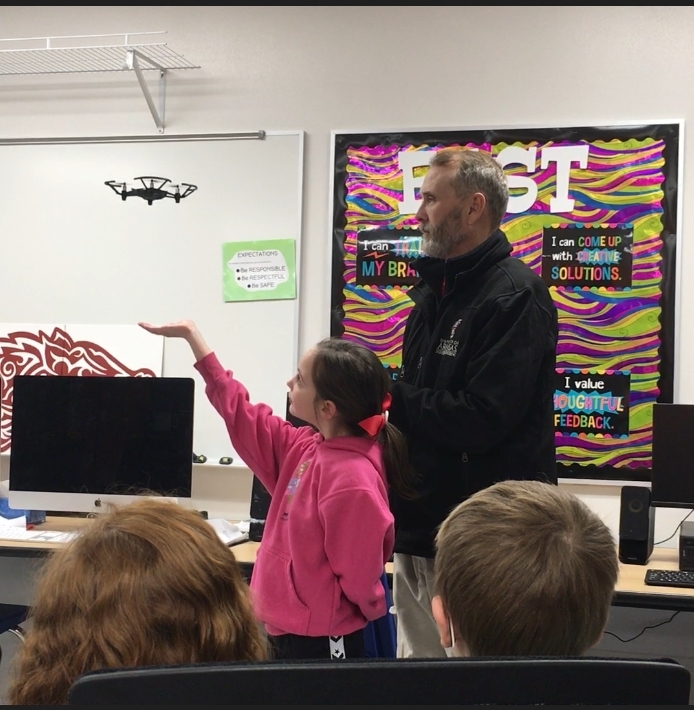 Isabella Earley, a student at Gentry Primary, watches a drone during a presentation from Rich Ham, associate director of the Operations Management graduate program. A partnership between the MSOM program and Gentry Public Schools is giving students a chance to learn about drones. Elementary students and teachers from Gentry Public Schools are getting a fresh look at water quality thanks to a partnership with the University of Arkansas that provides access to drone training for studying hard-to-reach areas. The partnership brings together Richard Ham, associate director of the Operations Management graduate programm and Dorothy Ivey, who facilitates the EAST program for Gentry Primary School. EAST stands for the Education Accelerated by Service and Technology program. Through the collaboration, students in grades 2-5 monitor stream health at Sager Springs in Siloam Springs, which feeds into the Illinois Watershed. Students encountered difficulty accessing some areas of the stream because of deep water and overgrowth, so drone training provided by the University of Arkansas is helping navigate streams to take pictures to monitor conditions. The project is called "Stream Team," and is a collaboration with the Illinois River Watershed Partnership and the Arkansas Game and Fish Commission. A grant to the EAST program from the CenturyLink Clarke M. Williams Foundation will allow the team to conduct a multi-year study. With help from the drones, second through fifth grade students learn about erosion, water quality, biology and watershed management using real examples from their local area. "This project is an incredible opportunity for these students," Ivey said. "The students love working with Dr. Ham." Ham provides training through the school year for fifteen EAST students and five instructors and parents. The instructors also receive material that helps them prepare for the Federal Aviation Administration's Commercial Drone Pilot certification.